Nine films were made about the Middle Earth Saga adapting the works of Tolkien. Six were given to Peter Jackson. Award winners three were. Two were given to Rankin-Bass. And one film was given to Ralph Bakshi. One film to rue them all. 9. 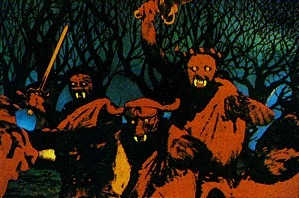 Ralph Bakshi’s animated Lord of the Rings. Why are we wearing dirty togas? This is probably the worstly directed film I have ever seen. It has two hours to g through over six hundred pages and it constantly stops to make the heroes and villains stare at each other for a really long time. Then the heroes just run away. At least it tries to be atmospheric, as most cartoons today ignore the mood, but here it just makes the villains seem cowardly and the heroes look dumb. It also fails to set a mood, since the villains are portrayed as frightening yet so ridiculously drawn and bumbling to be intimidating. It takes its time when it should be fast paced and it rushed through important exposition scenes like the council of Elrond. I know this is tough to process but their Gandalf is the worst supporting character ever. He shouts everything (unlike the subtle Gandalf from the books) except when he threatens he Balrog. He even shouts that Pippin is being too loud. After he dies it shows he other characters happily playing in Lothlorien when a mourning song is played for him. No wonder they are so happy, as their biggest liability is gone. The character designs are terrible. Aragorn looks like a native American. Legolas seems to be a woman wearing ten pounds of makeup. Frodo, Merry, and Pippin are identical. Boromir wears Viking horns. This whole film is a huge mess. It has some good qualities. The Nazgul start good. Their heads look like bags of rice, but that is not revealed until later. The scene where gimli discovers the sacking of Moria is well done, but it has one notably redeeming quality. It is laughably bad. I got a really good laugh from this, which is why I am glad I bought it at a thrift store. This was the most disappointing theatre experience I ever saw. It made m lose interest in seeing the next Hobbit film in theatres. It started good with more scenes like the first hobbit movie with Bilbo being heroic. The spider scene is very good. Then the elves ruin the movie. I found the Elven king to be boring, but it is really Legolas and Tauriel who ruin it. They made he rest of the fellowship look completely useless. This is supposed to be about how the journey makes them grow, but instead they just get saved by the same two characters over and over. Even worse the love story between Tauriel and Filli I mean Killi was extremely generic. I solved the riddle of the key way before Bilbo did making it as frustrating moment and I stink at riddles. It then got even worse with Smaug. His design was extremely generic. Bilbo did not come across as intelligent, but Smaug seemed to be magnificently stupid. It then ended on a lousy cliff hanger note, which deprived me of at leas seeing a good climatic ending. After the spiders there is not a single thing I would call good. At the same time it at least had okay visuals and dialogue. The characters were bad but not annoying. It is not terrible, but bad. The Pale orc, Azog, is a dull villain. Sauron was a useless villain. Smaug was incredibly dumb and begging to be killed. So many villains and so many disasters. I have looked up Hobbit film rankings and seen every possible order except and combination with Battle of the Five Armies at number 1. But it does not promise that much. I had low expectations for it after “Desolation of Smaug” and it did not disappoint. Thorin had to carry this one, and e actually did okay. Bilbo was in it very little, but at least he was good in his few appearances. What these films should have done is removed Legolas and Turiel to focus more on the dwarves as characters. Then make each film have its own distinct villain to make a more stand alone feel. Is there any point to watching it after Jackson’s Return of the King film was made? This film puts more emphasis on the ring corrupting Frodo and Sam, which makes very different scenes. Aragorn was portrayed with less character, but that made him seem like more a Christ figure. It also had a really good scene on the flag of the king. The songs are a bit of a mood killer, but I liked them besides that.